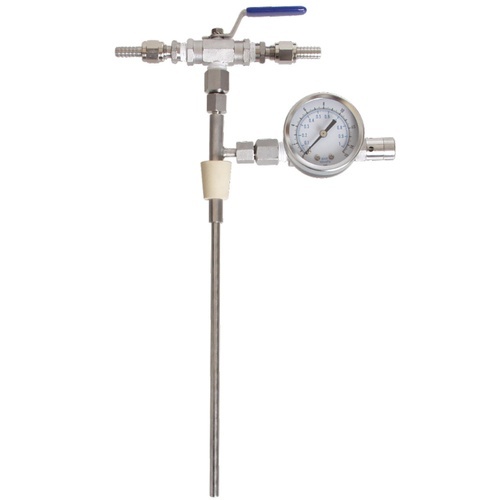 We think our Counter Pressure Filler is the best on the market and the Deluxe Counter Pressure Filler takes a proven design to the next level by adding a pressure gauge for monitoring bottle pressure and flared connections for easy cleaning. The gauge allows you to know the pressure in your bottle, an incredibly handy feature. The flared connections allow for easy cleaning as you can connect on or disconnect your lines in a matter of seconds. Traditionally these lines can be difficult to sanitize because they were permanently connected with hose clamps. Beer barb is 1/4". Gas barb is 5/16".